I have already introduced you to the estimable Mable Hoffman and her cookbook Chocolate Cookery. This book made its way to me via my Grandma's house. The copyright for my edition of this book is 1978. 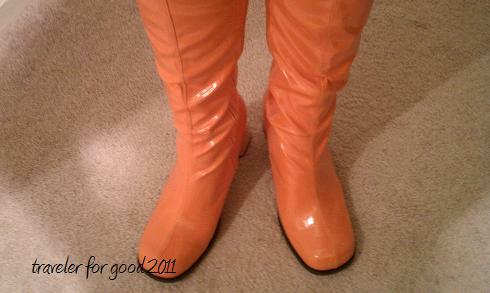 I think the heyday of these shoes was probably a little bit before '78, but in honor of Mable and her career in the 1970s (as well as the shoe challenge), I present a photo of my gogo boots. Now, onward to the recipe. One of my co-workers said that they had all the good flavors of fall in each bite. Apples are definitely in season here in Colorado, so there are a lot of options. I'm pretty sure the only way Mable was able to justify this recipe making into her chocolate cookbook was the 1 tablespoon of cocoa. Very sneaky Mable, very sneaky. Lightly grease a 9 inch square baking pan (or use silicone); set aside. Preheat oven to 375. In a large bowl cream shortening and sugar until light and fluffy. Add eggs one at a time, beating until very light and fluffy. Combine flour, powder, soda, salt, cocoa, cinnamon, nutmeg and cloves. With electric mixer on low, beat flour mixture into egg mixture until just combined. Stir in oats, apple and peanuts. Turn mixture into prepared pan. Bake 25 minutes or until edges begin to leave sides of pan. Cool completely before cutting. Sprinkle with powdered sugar (if desired). The good deeds challenge is an excellent cause-many of us take shoes for granted. Especially those that have to have matching shoes with all their dresses (one of my relatives has done this for years). I like this unique bar recipe- the cocoa was used like a spice rather than making a big chocolate impact. Nice pictures here! 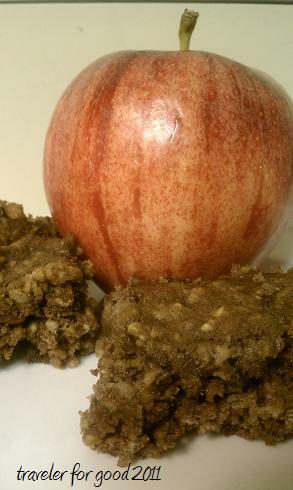 Spiced apple peanut bars?? Awesome idea! What a great Fall dessert. Sounds freakin delicious to me! Ah, time for Fall-themed recipes!! Cinnamon, nutmeg ... oats, apple ... all ingredients for this season. Awesome Soles project; what a great cause. I hope it all goes well! Thanks for stopping by ladies! Colorado weather being what it is we went from beautiful fall weather last weekend to cold rain and snow today. I guess I may have to stay in the kitchen.